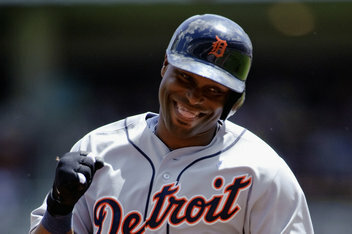 In a career that has spanned across 16 years with the Minnesota Twins, Los Angeles Angels, and now this season with the Detroit Tigers, Torii Hunter has solidified his name as a perennial all-star caliber player. On Sunday afternoon, Hunter added a milestone to his successful resume, slugging the 300th home run of his career against the Minnesota Twins in a 5-2 victory for the Detroit Tigers. With Austin Jackson on second base and a 2-0 count, Hunter connected on a pitch from Minnesota starter P.J. Walters that would clear the left field bleachers. The two-run shot would be the milestone homer for Hunter, as he would give the Tigers an early 2-0 lead in the first inning. Hunter would follow up with an RBI ground-rule double in the top of the ninth, scoring Omar Infante and extending the Tigers’ lead to 5-2. On the season, Hunter is batting .292 (74-for-253) with three home runs and 27 RBI. After an April in which he posted a .370 batting average and OBP/SLG/OPS line of .411/.500/.911, Hunter has witnessed his production gradually decline throughout May and June, wherein he is currently batting .196 with a paltry OBP/SLG/OPS line of .245/.239/.484 through 13 games in June. Over the span of his career, Hunter has raked over 2,000 hits and drove in over 1,100 runs, while collecting an impressive nine gold glove awards for his superb defense in center field. With the victory, Detroit improved to a 38-29 record and maintains a 4 1/2 game lead over the Cleveland Indians in the AL Central standings.